Had a great time. Saw lots of friends and had good long chats with some that I haven't had the chance to in some time. The rev left a pregnant (so to speak) pause after his call for marriage equality. I was too timid to cheer, even though I got a few cheers when I left a similar pause the last time I officiated. Karen looked lovely, the girls looked excited, Ian was rocking the tux, and Brian had a superfluous fork in his hand as he gave his toast. Perfect. Thank you both for taking and sharing your pictures! 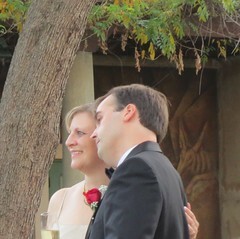 I don't have any from the photographer yet and these allow me show people some of the highlights. You're very welcome. Feel free to do whatever you like with the photos. On the flickr pages, you should be able to download the original image files.